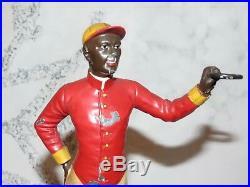 RARE VINTAGE PAIR BLACK AMERICANA LAWN JOCKEY. GROOMSMAN BOOKENDS - CAST IRON ON LEAD BASES. 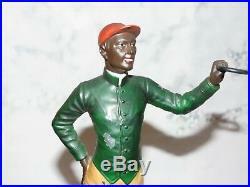 You are Considering a Pair of Original Black Americana Lawn Jockey/Groomsmen Bookends on Lead Bases. 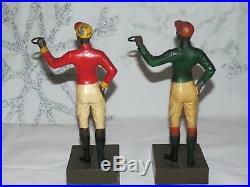 The jockeys, are circa 1940's, and are in great condition for age. 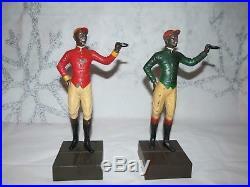 There is some relatively minor loss to the polychrome finish on the jockeys themselves as pictured. The paint is still bright with slight yellowing to the jodhpurs on each. Obviously hand painted they show differing character in their facial expressions. The measure approx 10-1/2" tall x 5-1/2" wide from elbow to ring. The bases measure 3-1/4" wide x 1" tall. Each one weighs approximately 4 lbs. Please view all photos, t. He photos you are viewing in this sale are of the actual item you will receive and are part of the description. We sell mostly Vintage and Antique goods, if you are expecting items to be in brand new condition, then most of the items we sell are not for you. Vintage and Antique items are very rarely in absolute pristine or new condition, they are what they are, older and in used condition. Please use the photos to help judge content and condition If you are unsure in any way please ask. Contact me if you need clarification. 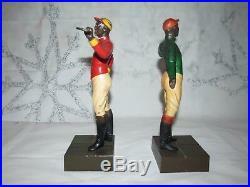 The item "VINTAGE PAIR CAST IRON LAWN JOCKEY BOOKENDS BLACK AMERICANA GROOMSMAN STATUES" is in sale since Saturday, December 1, 2018. This item is in the category "Collectibles\Decorative Collectibles\Book Ends". The seller is "tonto1117" and is located in Ada, Michigan. This item can be shipped to United States, Canada, United Kingdom, Denmark, Czech republic, Finland, Hungary, Australia, Greece, Portugal, Japan, China, Sweden, South Korea, Indonesia, Taiwan, Thailand, Belgium, France, Hong Kong, Ireland, Netherlands, Poland, Italy, Germany, Bahamas, Israel, Mexico, New Zealand, Singapore, Switzerland, Norway, Saudi arabia, United arab emirates, Qatar, Kuwait, Bahrain, Malaysia, Chile, Colombia, Costa rica, Panama, Trinidad and tobago, Guatemala, Honduras, Jamaica, Barbados, Bangladesh, Bermuda, Brunei darussalam, Bolivia, Egypt, French guiana, Guadeloupe, Iceland, Jordan, Cambodia, Cayman islands, Sri lanka, Luxembourg, Monaco, Macao, Martinique, Maldives, Nicaragua, Oman, Pakistan, Paraguay, Reunion, Uruguay.